I've made all sorts of chutneys and chunky fruit sauces that I've refrigerated and used quickly, but I've never preserved jars and jars of summer fruit with the proper canning method. It seems like I should try it, and what could be better than popping open a jar of homemade berry preserves in the dead of winter? Or, how pretty would it be to have a big stack of gleaming, jewel-toned jars of translucent, homemade jelly on a shelf in the kitchen? I'm one step closer to experiencing those things since I received a review copy of The Blue Chair Jam Cookbook . Blue Chair Fruit is a Bay Area jam company specializing in intensely flavored preserves, and the owner, Rachel Saunders, reveals her techniques for the preserving process in this new book. The reader is walked through definitions of jams, jellies, and marmalades, and then the fruit itself is discussed from seasonality, flavor, and texture to acidity and pectin for balancing a preserve. Then, the preserving process is carefully described with information about necessary equipment, sterilization, and cooking stages for different types of preserves. The recipes section offers preserves for every month of the year starting with citrus marmalades in January and moving into strawberry and rhubarb season in March. There's an early summer peach jam with green almonds that sounds lovely, and summer boysenberry jam with lemon verbena. There are jams with berries, plums, figs, and tomatoes, and a fall quince marmalade that I really want to try. 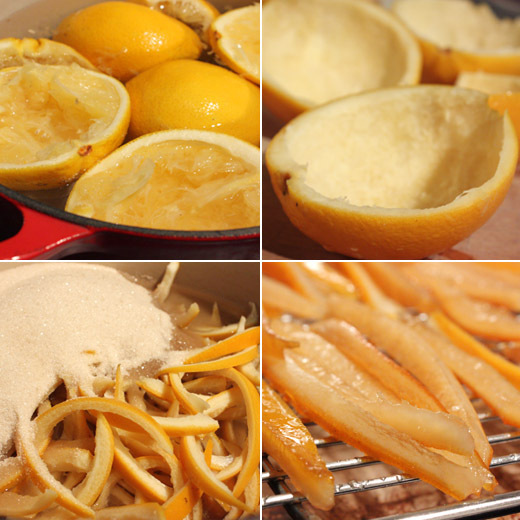 In the meantime, since I haven't yet collected all the equipment I'll need for canning, I started with the candied orange peel. I grabbed some Texas navel oranges and set about starting the process. First, the oranges were halved and juiced. The halves were then covered with water in a stock pot, the water was brought to a boil, simmered for ten minutes, and then drained and that process was repeated twice more. The brief cooking, draining, and cooking again helps to remove bitterness from the orange rinds. Next, the orange halves were covered with water again, and this time, they were left to cook for about an hour until tender. They were drained and allowed to cool, and then the pith and fibers were scooped from each half. A thin layer of white pith remained in each orange half as they were sliced into thin strips. 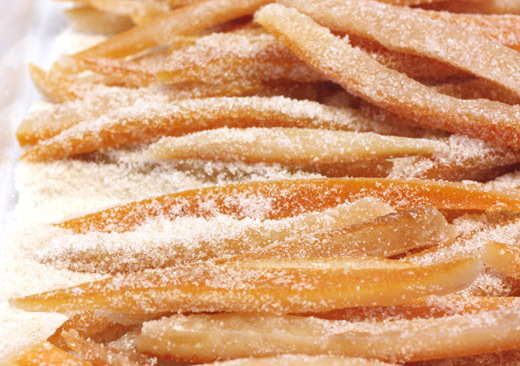 The strips were then cooked with sugar and water for about an hour until the pith sides began to look translucent. The strips were left to cool in the sugar syrup and were then transferred to a wire rack set on a baking sheet where they sat until dry a day and a half later. 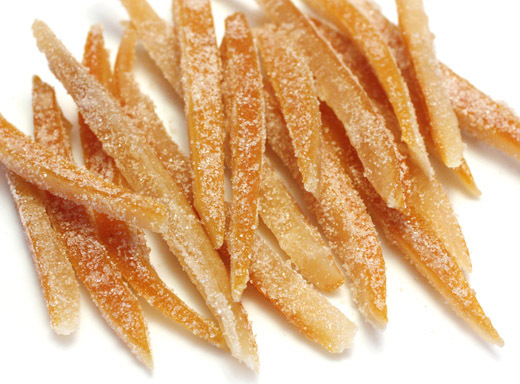 The last step was rolling the dried orange strips in sugar, and now they could sit for up to twelve months if they had a chance of lasting that long. They're chewy, bitter, sweet, and full of orange flavor. I can't wait to chop some of them to stir into dough for panettone or place pieces of them on top of homemade dark chocolate bark with nuts and swirls of white chocolate. I'll probably think of some other cookies or cakes to use them in too causing them to be gone far too fast, but this was a great first step in extending seasonal flavors. Now, I need to finally try my hand at canning and filling my kitchen with pretty jars of preserves. Sometimes the simplest things really are the best. 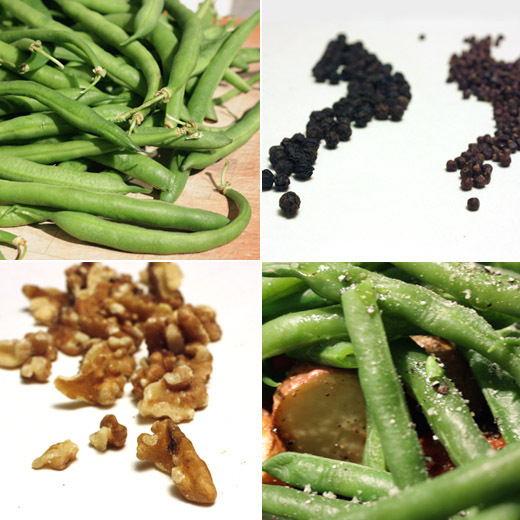 A mix of green beans, walnuts, walnut oil, and grains of paradise is one of those simple things. Well, it's simple if you can easily get your hands on walnut oil and if you're lucky enough to locate grains of paradise. We do have walnut oil in a few of our grocery stores here, but that may not be common in other places. The spice grains of paradise was another matter. I hadn't even heard of it before I read Amanda Hesser's Cooking for Mr. Latte . 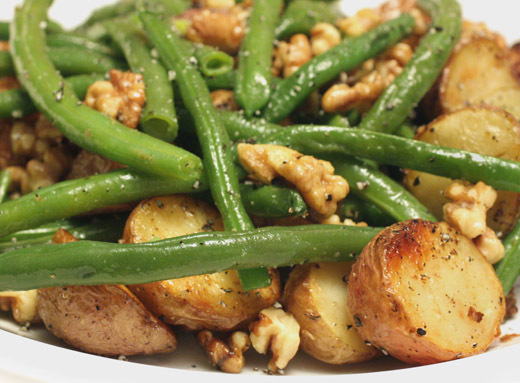 In that book, she mentioned it several times, and one mention in particular was in a dish of haricots verts with walnuts and walnut oil to which she suggested adding small potatoes. A few weeks ago, there was a party at Rain Lily Farm in Austin celebrating Hesser's new book The Essential New York Times Cook Book . When she signed my copy of the new book, I mentioned to her that I had been trying to find grains of paradise because I'd become so curious about it. She encouraged me to keep looking. When I got home, just for fun, I checked to see if this spice was used in any dishes in the new book of over 1,000 recipes from the New York Times. The index led me to page 30 for a Bloody Paradise which is a bloody mary cocktail made with grains of paradise. Hesser wrote in the intro to that recipe that she had become obsessed with the spice in 2000 and was (jokingly) sure Americans would become convinced they couldn't live without it. Well, one did. As luck would have it, just two weeks ago, Austin got its very own, brand new Savory Spice Shop. Let me just say that I now have easy access to not just grains of paradise but also tomato powder, various cocoa powders, a plethora of chile powders, and peppercorns of every color. So, what are grains of paradise anyway, you may be wondering. I turned to my deluxe edition of the Food Lover's Companion which I received as a review copy last year. In the spice glossary, grains of paradise are defined as "small, brown, round seeds indigenous to the west coast of Africa and used as a spice. Though hot and pungent, this spice has an exotic spicy quality that hints of ginger, cardamom, coriander, citrus, and nutmeg." Hesser uses it interchangeably with black pepper. In the top right photo below, black peppercorns are on the left and grains of paradise are on the right. The grains need to be ground just like black pepper, and I placed mine in a spare peppermill for easy use. Kurt and I tasted ground grains of paradise side by side with freshly ground black pepper. We found the two spices to be similar with grains of paradise seeming less hot and more herby with a slightly stronger, almost piney flavor that's also found in black pepper. I detected a faint suggestion of nutmeg in it as well. I prepped the green bean dish just as it was described in Cooking for Mr. Latte. 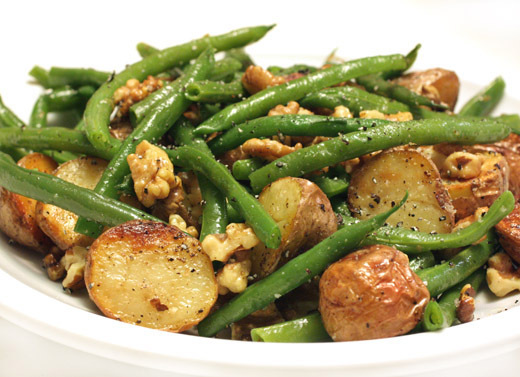 I used CSA green beans, rather than haricots verts, which were blanched, drained, and dried and then tossed with toasted walnuts, roasted potatoes, walnut oil, and ground grains of paradise. It was a delicious combination of flavors and textures set off by an interesting spice. The dish couldn't have been simpler once I knew exactly what the spice was and where to find it. Hope you're having a simple and splendid holiday week. Happy Thanksgiving! 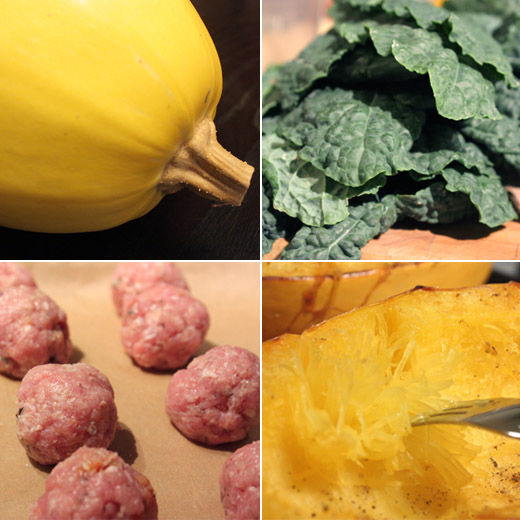 How about a dish of turkey with squash that has nothing to do with Thanksgiving? When I was digging through my files to locate the mini cranberry meringue pies the other day, I also found this healthy, autumnal meal from last October's issue of Living magazine. I have to admit, I haven't always been the biggest fan of spaghetti squash, but I think I've finally come around to really liking it. 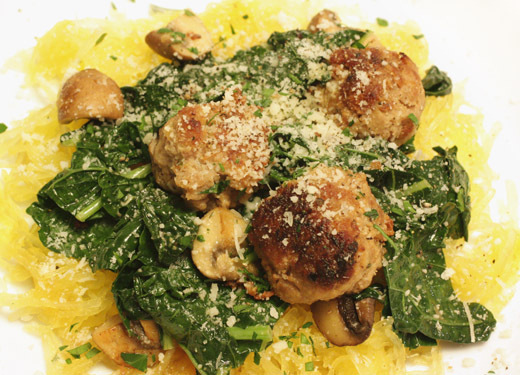 Here it's treated just like actual spaghetti with the meatballs piled on top of it, and with the sauteed mushrooms and greens, the sweetness of the squash is balanced. Now, you could go all the way with the theme and make a red sauce to top the spaghetti squash, but this dish was kept light with a sauce of simply simmered broth and extra vegetables. A nice, big spaghetti squash was split down the middle lengthwise, seeds were removed, and it was roasted until tender which took about 45 minutes. When it was cool enough to handle, the skinny strands of squash were scraped with a fork into a colander and allowed to drain. Meanwhile, onion and garlic were sauteed and allowed to cool. Half of them were mixed into the ground turkey meatballs, and the other half were reserved for the sauce. The meatballs were browned in a large saute pan and then removed to a plate. Next, sliced mushrooms were sauteed, the reserved onion and garlic mixture was added to them, the meatballs were placed back in the pan, everything was covered with some stock, and it was left to simmer for a few minutes. Last, greens were added, and they could have been any greens but I used some local kale, and they were left to wilt before serving. 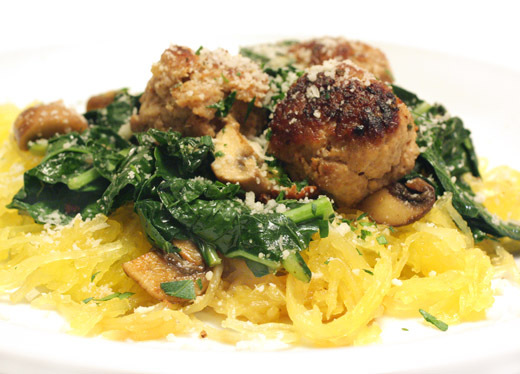 The spaghetti squash was placed on plates and topped with the meatballs, mushrooms, greens, and sauce and hit with some grated parmesan. I can't even remember how I last prepared spaghetti squash and why I then avoided it for so long, but I'm very glad I finally tried it again. With a dish that looks so much like standard spaghetti and meatballs, you don't even stop to consider that what you really have is a light and healthy, vegetable-heavy meal in disguise. And, now, enough of this talk of turkey with no mention of the big holiday. It's time for Thanksgiving week. I thought this recipe was from last year. The image of these cute, little, mini pies had been on my mind since last winter when I vowed to attempt them when fresh, fall cranberries came around again next time. Actually, this first appeared in Living magazine in November 2006, but it did appear again in a special holidays publication last year. I had the 06 article tucked away in my files, and I pulled it out last week to finally try this. The pasty is a citrus version of a pate sucree I've made before with the addition of lemon and blood orange zest. It occurred to me that I should make a big batch of these mini pastry shells and keep them in the freezer to use as needed. They would come in especially handy when I have some leftover pumpkin puree like I probably will later this afternoon. 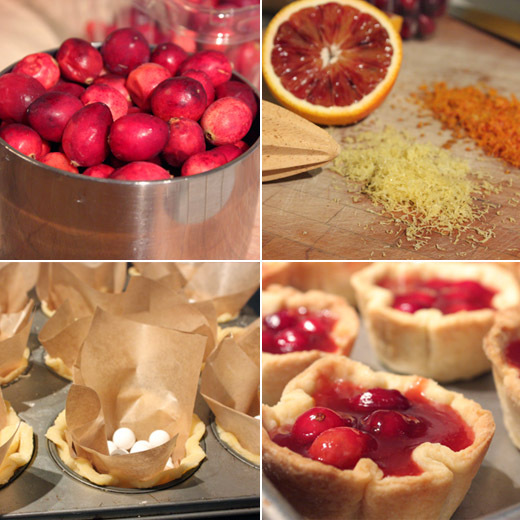 In this case, those handy pastry cups were filled with thickened cranberry sauce that was made in two stages. First, cranberries were cooked, and the juice was strained from the berries. Second, that juice was combined with whole cranberries to make a sweet, tart, filling with pops of flavor. Fluffy, toasted meringue topped it off. The pate sucree was cut into four-inch circles which were crimped and fitted into twelve standard muffin cups. Each cup was lined with a small square of parchment paper, filled with weights and baked for fifteen minutes. The weights and parchment were removed, and the cups were baked for another five minutes or so. Once cool, they were ready to be filled. For the filling, first, fresh cranberries were brought to a boil with sugar and water. They were simmered until the cranberries burst and then passed through a sieve to extract the juice. The recipe states the solids should be discarded, but I'm getting more and more militant about not wasting food, so I kept the cranberry solids and enjoyed them on plain yogurt for breakfast. Next, the cranberry juice was returned to a saucepan, and sugar, lemon and blood orange zest, salt, cinnamon, cloves, and more whole cranberries were added. This time, the cranberries were cooked over a lower heat to prevent them from bursting. They should just become soft. Cornstarch was whisked into a mixture of blood orange juice and water, and that was added to the cranberries and juice to thicken it. Once cooked and cooled a bit, the filling was divided among the pastry cups, and they were chilled until set for at least an hour. 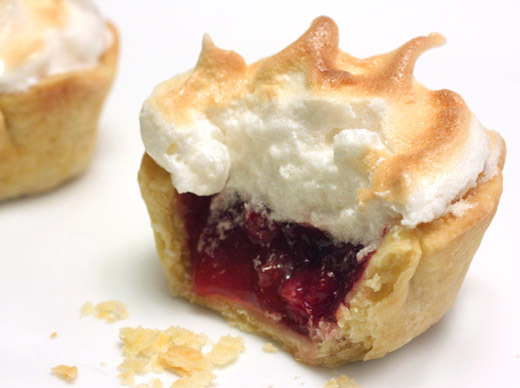 Last but not least, a meringue was whipped to glossy peaks, spooned onto each mini pie, and the tops were browned under the broiler in about a minute. While trying to get these pies done in less time than I should have planned to spend on them, the extra step of straining cranberries and then adding more whole cranberries seemed a little fussy. In the end though, I see why it mattered. The thickened juice nicely suspended the softened, whole cranberries in a way that a standard cranberry sauce would not have done. That being said, for a quicker version, a thick, sweet cranberry sauce would work fine here. 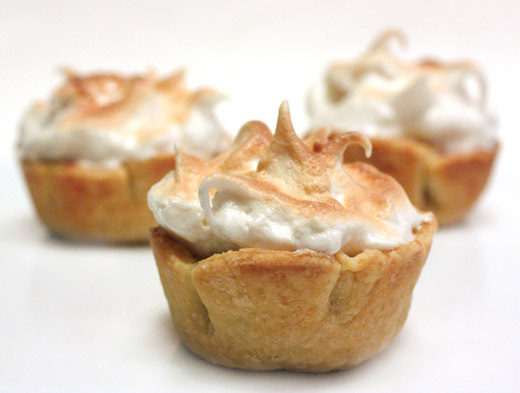 Also, I'm always up for a meringue topping, but Kurt suggested that whipped cream would have been just as good. Either way, these festive, seasonal treats have earned a trip from my temporary, to-try file to my permanent, keeper file. Zoë Francois, What Are You Reading? 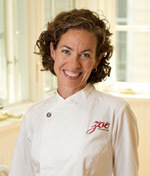 Having trained at the Culinary Institute of America, Zoe Francois had already enjoyed a successful career as a pastry chef before she began writing cookbooks. She has also taught baking and served as a consultant to restaurants. In 2007, she and Jeff Hertzberg wrote their first book Artisan Bread in Five Minutes a Day which made daily bread baking a doable task. Last year, their second book, Healthy Bread in Five Minutes a Day , was released, and that applies the same principles from the first book to loaves made with whole grains, fruits, and vegetables. It even includes a chapter on gluten-free breads. They're currently busy working on a third book due out next fall, and that one will be Pizza and Flatbreads in Five Minutes a Day. You can keep up with Zoe and Jeff and find more information about their books and upcoming events by checking their site. I knew Zoe would have some interesting books to mention when I asked what are you reading? Few places bring me as much joy as sitting at Tartine in San Francisco. Elizabeth Prueitt and Chad Robertson have managed to infuse their passion into every aspect of the bakery. The result is exquisitely prepared pastries, breads, and tartines made from Chad’s loaves. Now, from my home in the Midwest, I can visit the bakery through their cookbooks. First I drooled over the pages of Elizabeth’s book on pastries, Tartine , and now I am doing the same with Tartine Bread , Chad’s heroic tome on breads. The book itself is gorgeous and exudes Chad’s love for the craft of bread baking. The other book at my bedside is The Tuscan Year: Life and Food in an Italian Valley by Elizabeth Romer. She writes about the seasonal cooking of Tuscany from a time when there was little choice but to cook what was grown locally. It wasn’t hip it was essential. The stories and recipes are old world and hearty. This book inspired me to make Fiori di Zucchini Ripieni (stuffed zucchini flowers) this summer and has me looking forward to roasting chestnuts with white wine. The book is part history lesson, part cookbook, and a glimpse at a Tuscan life. Thank you for participating, Zoe. Check back to see who answers the question next time and what other books are recommended. When we were in Scottsdale in September, we visited the Heard Museum which prides itself on an accurate display of arts and cultures of Native peoples, especially those from the Southwest US. The collections include Southwest American Indian cultural art, fine art, and contemporary pieces in addition to beautiful jewelry, textiles, baskets, ceramics, and beadwork. After exploring the museum, I somehow landed in front of the book shelf in the gift shop, and that's where I found the James Beard Foundation award-winning book Foods of the Southwest Indian Nations by Lois Ellen Frank. This informative book tells of food traditions that continue today, the seasonality of the food, and the sustainable ways in which food has always been hunted and gathered by Native peoples. The recipes range from very traditional ones such as piki bread, which a young woman must master before being considered a suitable bride, to the more modern pumpkin corn soup with ginger-lime cream and blue corn gnocchi with guajillo chile sauce. The 100 plus dishes in the book have all been adapted to current tastes and modern kitchen equipment. There's an entire chapter devoted to chiles which I'll be turning to frequently. It includes fresh green chile soup with tumbleweed greens, chile turnovers, and red and green chile sauces. 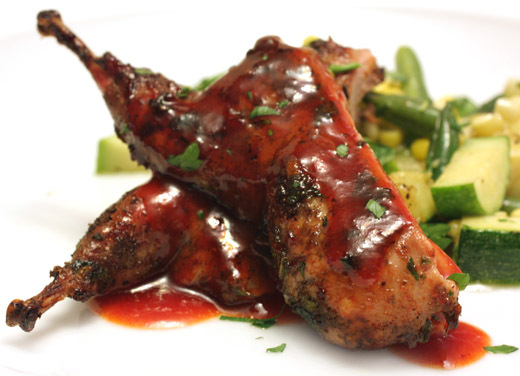 With chiles in mind, I had to try the marinated grilled quail which was served with a dried chile and honey glaze. I really like quail and usually order it when it's featured on a restaurant menu, but for whatever reason, I had never before cooked quail at home. We always have fresh, local quail ready and waiting at Whole Foods, and I finally bought some. The quail were washed, patted dry, and their tiny, little wings were removed. The wings went into the freezer for stock some other day. Then, the quail were marinated in a mixture of chopped sage, parsley, rosemary, chipotle chile powder, chopped fresh serrano chile, olive oil, minced garlic, lemon zest, and salt and pepper. They sat in the marinade in the refrigerator for several hours. Then, the glaze was made from rehydrated, dried New Mexico chiles, and I added a dried cascabel just because I had it. The softened chiles were pureed in the blender with some of their soaking water and honey, and then the puree was passed through a sieve. The quail were cooked on the grill for about five minutes per side, and then I spooned some of the glaze over them and let them grill for another minute per side. 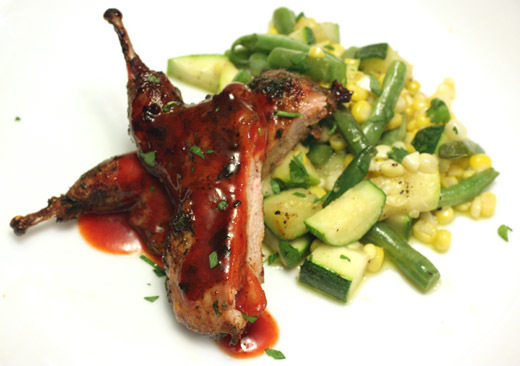 I sauteed CSA zucchini, corn, and green beans for a side dish, and the quail were served split in half with more glaze drizzled over top. 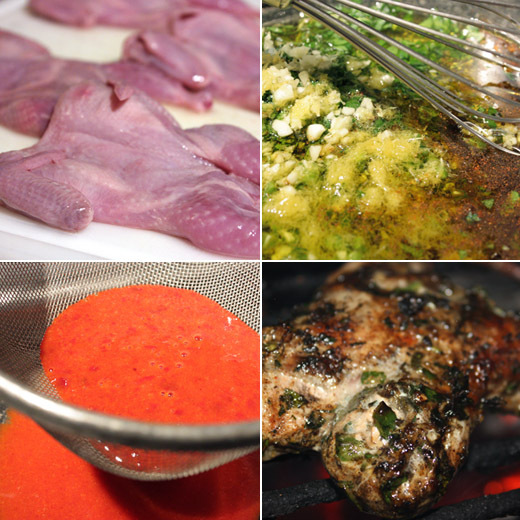 If you haven't had quail, it's mild for a game bird, and you definitely don't want to overcook it. Five minutes per side of grilling was just right for these birds, but any smaller and the time should be reduced. The searing heat of the grill crisped the skin, and the marinade left the meat flavorful and tender. I especially liked the glaze with its earthy chile heat tempered by the honey. Next from the book, I want to try the spicy pinto bean ravioli or maybe Indian tacos with frybread. Do you have a mental list or an actual list of things you hope to cook some day? Croissants was one item on my list. Earlier this year, Michael Ruhlman wrote about unfinished business and challenged everyone to commit to accomplishing something new in the kitchen. I left a comment on that post thereby publicly committing to attempting both gnocchi and croissants before the end of the summer. So, I did finally take a stab at making gnocchi, but I had a really good reason for waiting on the croissants. It was hot. It's always hot here during the summer, but fear coupled with a warm kitchen and humid air prevented me from spending three days on croissants during the summer season. I needed time to convince myself that even if my first try was a failure the effort would be a learning experience, and I needed the weather, my schedule, and the universe in general to cooperate. Last week, we had some nice, cool, non-humid days, and I finally went for it. I'm certainly no expert after only one go at making these lovelies, but I now understand that waiting for a cool day was a very, very good idea. There is a lot of butter involved here, and too soft, oozing, warm butter would have been disastrous. I had heard several times that the very best croissants to make are the ones from Baking with Julia written by Dorie Greenspan. I attended a cooking class taught by Dorie a couple of weeks ago, and when she signed her new book for me after the class, I mentioned that I was planning to try those croissants. She said "it's a project, but it's worth it." She couldn't have been more right. I knew that to make croissant dough, a whole lot of butter needed to be layered into some dough. I knew it was necessary to roll out the layered dough and butter and fold and turn. I was sure that I would fail instantly at this and there would be butter squishing out in every direction, and I would never get the dough rolled into a straight enough shape to fold properly. I was wrong. Before starting, I read the recipe all the way through about ten times. Then, I set about following each step as precisely as I could. The dough was made with yeast, flour, sugar, salt, and milk. It was made in a stand mixer with a dough hook. As instructed, I added a little more milk when the flour wasn't all worked into the dough. When it came together, the dough was wrapped in plastic and refrigerated overnight. The next day, I mixed four and half sticks of cold butter with two tablespoons of flour and pressed it into a thick oval. My oval of butter wasn't all that attractive because of the wrinkles left by the plastic wrap, but it really doesn't matter how it looks. I refrigerated the butter oval for an hour or two before proceeding. The next step was what I thought would be the scariest. The dough was rolled into a wide oval, and the butter oval was placed in the center of it. The dough was folded over the butter, and then, the butter had to be distributed across the width of the dough. This was done by whacking the packaged dough and butter bundle with a rolling pin. Slowly but surely the butter did work its way throughout the dough, and it did not result in the squishing mess I had anticipated. One small victory was mine. 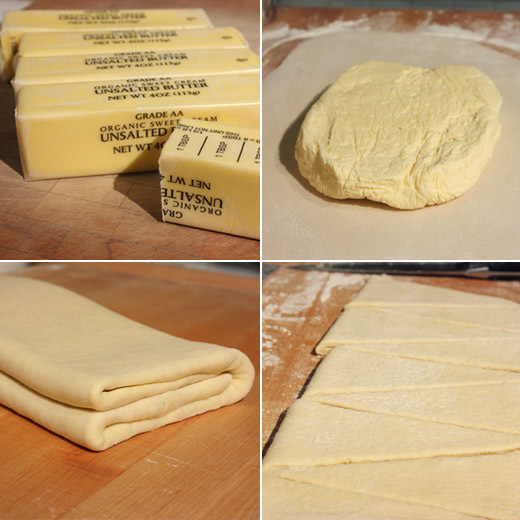 After distributing the butter, and rolling a little, you are left with a big rectangle of butter-filled dough, and you give it its first fold. Excess flour was brushed off, the dough was folded in thirds like a letter, and it was placed on a baking sheet, covered with plastic wrap, and refrigerated for two hours. My first fold of croissant dough went off without a hitch. Next, the dough was rolled again into a big rectangle, it was folded in thirds once again, and it was placed back in the refrigerator for another two hours. Then, it was time for the third and final folding. The dough was rolled yet again into a big rectangle, and this time, the dough was folded inward in quarters with the last fold closing like a book, and that double turn is known as the wallet. I loved making the wallet. I didn't have finished croissants yet, but I felt like I had really accomplished something by successfully arriving at this point. Interestingly, at this point, or after any of the folds, the dough could have been placed in the freezer to store for a later date. It should be thawed overnight in the refrigerator before proceeding with the next step. Otherwise, after the last fold, the dough should be refrigerated for two hours before proceeding, and I left it refrigerated overnight. At last, it was time to actually make the croissants. The chilled dough, with all those folded-over layers of butter, was cut in half and one piece went into the freezer while the other one was rolled into a big rectangle one more time. That was folded in half. That double layer of dough was cut into triangles. 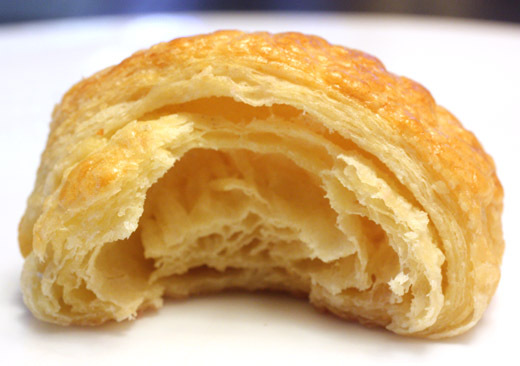 The double-layered triangles were unfolded back out into a single layer, and the dough was cut down the center to separate the triangles, and croissant forming began. After cutting the triangles, there are two scrap pieces of dough from each end. Those scraps are used to make little footballs of dough that sit in the back of each croissant to help plump them. Or, if you're making almond croissants, which I also did, a little ball of almond paste would be used instead. 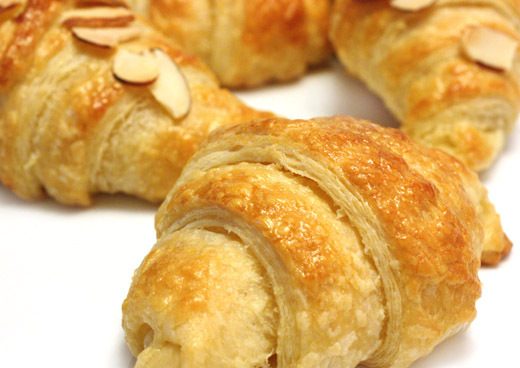 To form each croissant, a dough triangle was picked up and stretched to twice its length. The football of scrap dough or ball of almond paste was placed at the wide end of the triangle. 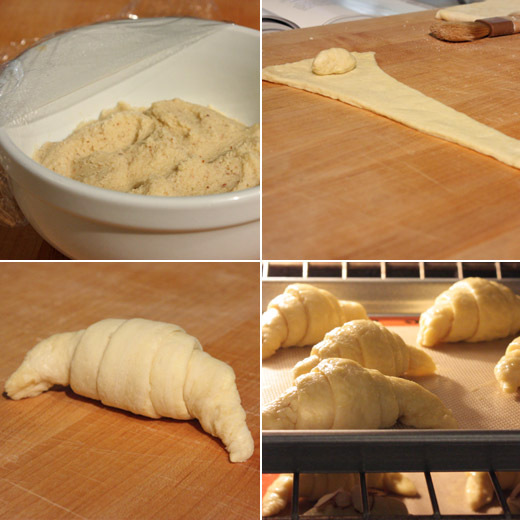 Then, the triangle was rolled from wide end down to small end, and voila, croissants were born. 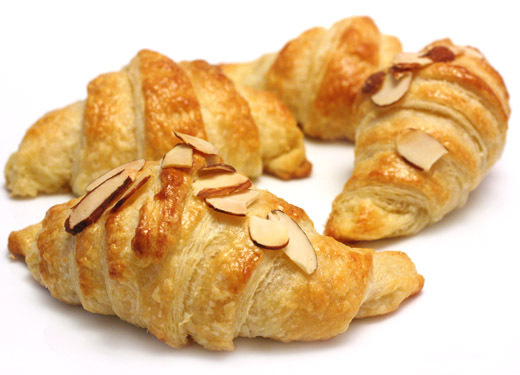 After filling two baking sheets with croissants, they were brushed with an egg wash, the almond paste filled ones were sprinkled with sliced almonds, and they were left to rise for three hours before being baked. Yes, this was a project. Mixing the dough on the first day was quick and easy, but you do need to have two days thereafter during which you can come into the kitchen every couple of hours and tend to the dough and then spend the time to form the croissants and wait for them to rise. But, you already know I'm going to tell you it is absolutely worth every minute of your time. After one bite, I declared that these croissants were hands-down the most delicious things I've ever baked. The bonus to all of this is that, that last time the dough came out of the refrigerator, it was cut in half. Half was used to make these croissants, and the other half is in the freezer. I can use that to make more croissants whenever I want. When it's gone, I'll definitely make the dough again just as soon as the weather, my schedule, and the universe are all aligned once more. Last week in our CSA bushel, we received a big, leafy, gorgeous head of bok choy. In the past, my favorite things to do with bok choy were to use it in a brothy soup with thin rice noodles or to simply saute it with some sesame oil. Nothing has changed regarding how great that soup and sauteed bok choy are, but I just wanted to do something different with it this time. I started pulling books off the shelves, and found two very similar ideas in two different books and both used full-sized bok choy, which is what I had, rather than the baby variety which seems to be more common in a lot of recipes. I mixed and matched and the result was what you see here. First, I found a pan-fried noodle dish made with bok choy and pork in Harumi's Japanese Cooking . In the recipe, she suggests other meats can be substituted for pork, so that got me thinking. The other key to her dish was the noodles that were added to the sauce. 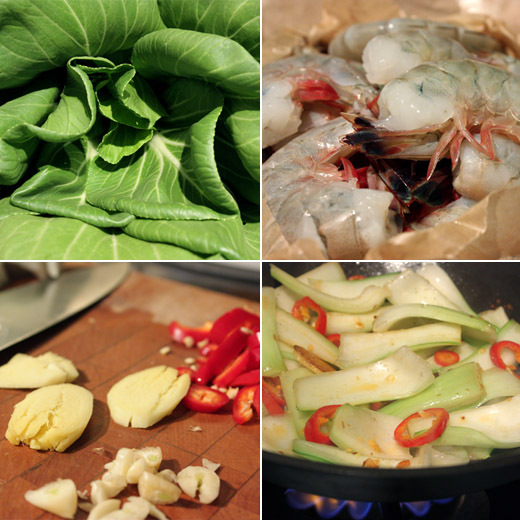 The second idea came from Eating Local , and that one involved stir fried shrimp and bok choy with added sliced red chiles. The sauces from both recipes were almost the exactly same, so I set about stir frying shrimp, of course I added the red chiles from the Eating Local recipe, I took the noodles from Harumi's dish, and dinner was served. Since this was the big kind of bok choy, it was necessary to cut the leaves from the stems, roughly chop the leaves, and slice the thick stems. The red chiles were thinly sliced as was a clove of garlic, and a couple of slices of peeled ginger were smashed with the side of a knife. With everything prepped, the noodles went into boiling water while the shrimp were stir fried first. After a couple of minutes in the wok, the shrimp were removed to a large bowl, and the garlic, ginger, and chiles were tossed in the wok before the bok choy stems were added. The stir frying goes quickly, but to be sure the stems become tender before browning, a little water may need to be added to the wok. It was needed in my case, and about two minutes later, the stems were good to go. 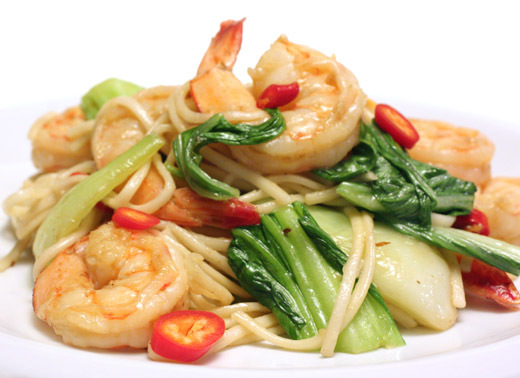 The bok choy leaves were added last, really just to wilt, and the shrimp were re-warmed and stirred into the mix. I removed all of that to a bowl that was kept warm next to the stove so that I could add the cooked and drained noodles to the wok. The noodles were stir fried with a little oil, and then topped with the sauce. The sauce was a mixture of oyster sauce, soy sauce, cornstarch, sesame oil, and rice wine. 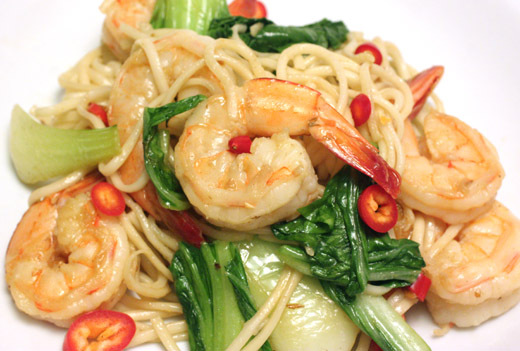 Last, I tossed the noodles with the shrimp and bok choy mixture. There's something about stir frying that almost always causes me to have a minor freak out at some point. I either think things are cooking too quickly, or I realize I forgot to chop something, or everything just sticks to the wok. Amazingly, nothing went horribly wrong this time. This dish would have been great with just about any kind of greens, but the bok choy leaves and stems gave it nice contrasting textures. The sauce was delicious, the chiles gave it spice, and next time I have bok choy on hand I'll have one more meal in mind for it. There are so many great food blogs out there that I visit regularly and that always make me hungry. One in particular that never fails to inspire is Delicious Days. I recently bought a copy of Nicole Stich's book which was released in 2008, also called Delicious Days , and I hear she's working on a second book now. Just like the blog, the book is full of beautiful photos and delectable and varied food. This green chocolate mousse is from the "sweet and irresistible" chapter where I've just marked the coffee power, coffee-topped panna cotta, to try next. 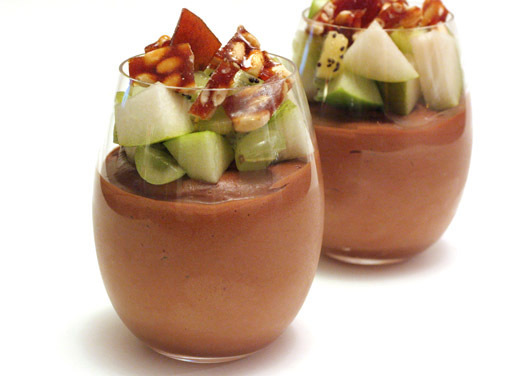 The green part of the mousse is obviously the green fruit that crowns the top, but there's also a secret green ingredient hidden in the mousse itself that adds a subtle uniqueness. Extra virgin olive oil is the secret, and you would probably never guess that that's what gives the mousse a little special touch. One more element of the dessert which added sweetness and texture was chopped pieces of pine nut brittle that were sprinkled over the fruit. I used a bar of El Rey chocolate with about 70 percent cacao, and it was chopped into chunks and melted in a double boiler. 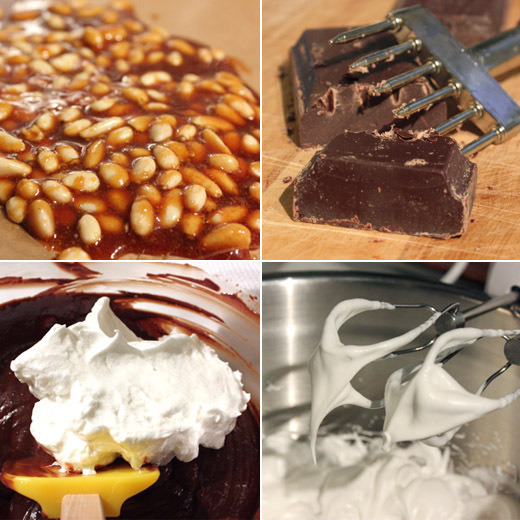 Once melted, the olive oil was stirred into the chocolate. The brittle was a simple affair of caramelized sugar to which pine nuts were added and that was poured into a flat layer and left to cool. The mousse was finished in the traditional way by adding egg yolks that had been whisked with sugar although it was raw cane sugar in this case. The egg whites were beaten until stiff with regular granulated sugar. And, last, cream was whipped. That does require three small mixing bowls, but you can use a hand mixer for the egg whites and then move it directly into the cream. You don't want to go the other way because any fat from the cream will prevent the egg whites from reaching their full volume. With everything whipped and ready, the egg yolks were added to the chocolate first, then the egg whites were folded in, and that was followed by folding in the whipped cream. 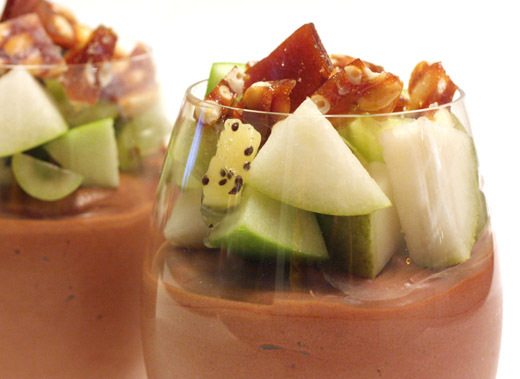 The mousse was portioned into individual cups and refrigerated, and just before serving, a green apple, pear, a kiwi, and some grapes were chopped to go on top followed by broken bits of brittle. The rich and chocolaty mousse was a divine dessert, and I found complete bliss just in licking the spoons and bowls while making it. However, the fruit and brittle topping took it to another level. The fresh, crisp flavors of the green fruits were a nice contrast to the rich, creamy layer below, and the nuts and caramel of the brittle brought sweetness and serious crunch. This is going to be a fun book to continue cooking through, and I'm already curious about what the next one will hold. Dianne Jacob, What Are You Reading? Writing coach, author, and freelance editor Dianne Jacob has given us the valuable and informative handbook for food writing Will Write for Food: The Complete Guide to Writing Cookbooks, Blogs, Reviews, Memoir, and More . The new edition, just released in July, won the Cordon D’Or International award for Best Literary Food Reference Book. Dianne started her blog last year when updating the book, and there, she covers freelance writing, blogging, recipe writing, ethics, and more. She is a judge for both the James Beard Foundation and for the International Association of Culinary Professionals annual cookbook awards. She is also the co-author of the cookbook Grilled Pizzas and Piadinas , with chef Craig Priebe, regularly edits cookbooks for national publishers, and has written for Salon.com, The San Francisco Chronicle, and Gastronomica magazine. Dianne is busy with several upcoming writing classes, workshops, and signings which are listed on her site, but I managed to steal a moment of her time when I asked what are you reading? At BlogHer Food in San Francisco recently, one of the best parts was when Shauna James Ahern attended my session on storytelling, and another was hearing her speak at the ending keynote. I have a copy of Shauna's new book, Gluten-Free Girl and the Chef: A Love Story with 100 Tempting Recipes , written with her husband, chef Daniel Ahern. I read it like a novel. It tells the story of how they met, how she cooks for him, how he cooks for her, and their new life together. I enjoyed it as much as I love Shauna's long hugs. The joy of their new life together comes through with fierceness, honesty and poignancy. Even though she's the Gluten-Free Girl, this book is for people who love to cook, enjoy a good love story, and believe in food's healing powers. Also while at BlogHer I met Georgia Pellegrini, author of Food Heroes: 16 Culinary Artisans Preserving Tradition . 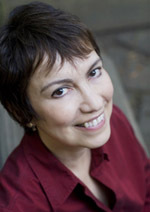 I found myself immersed in her passionate, well-researched profiles and impressed with her chef background at Blue Hill. Most of all, her writing is lively, sensuous and geeky in the most delightful way, and she lists no professional writing credentials. Damn. kicked myself for not thinking of such a clever book idea myself. But then, she travelled all over Europe and the US to find these beekeepers, persimmon massagers and seed savers. I was in Chicago recently to give a talk, and spent at least an hour lost in a reverie in the beautifully-curated cookbook section of Unabridged Bookstore. It was there that I found the Alice B. Toklas Cookbook , with a foreword by MFK Fisher. I had to buy it immediately, and turned to Toklas' infamous recipe for hashish fudge. I can't wait to read more, particularly when the chapters have such titles as "Dishes for Artists" and "Murder in the Kitchen." Thank you for participating, Dianne. Check back to see who answers the question next time and what other books are recommended.